A traditional Punjabi recipe of brinjals, roasted and skinned into an exotic preparation. Roast the brinjal on low fire on all sides till the skin turns black. Remove from fire and peel off the skin. Wash and chop into large chunks. Heat oil in a pan and add cumin seeds. Add ginger and garlic and sauté till light brown. Add onions and sauté till golden brown. Sprinkle coriander powder. Add chopped tomatoes and cook on medium heat for three to five minutes or till soft. Add brinjal pieces (optionally add half cup boiled peas). Add garam masala, dry mango powder (or baigan bharta powder), Chilli Powder and Salt to taste. Mix well. Add little water if required. Stir and fry till it turns light brown. Add ghee and mix. 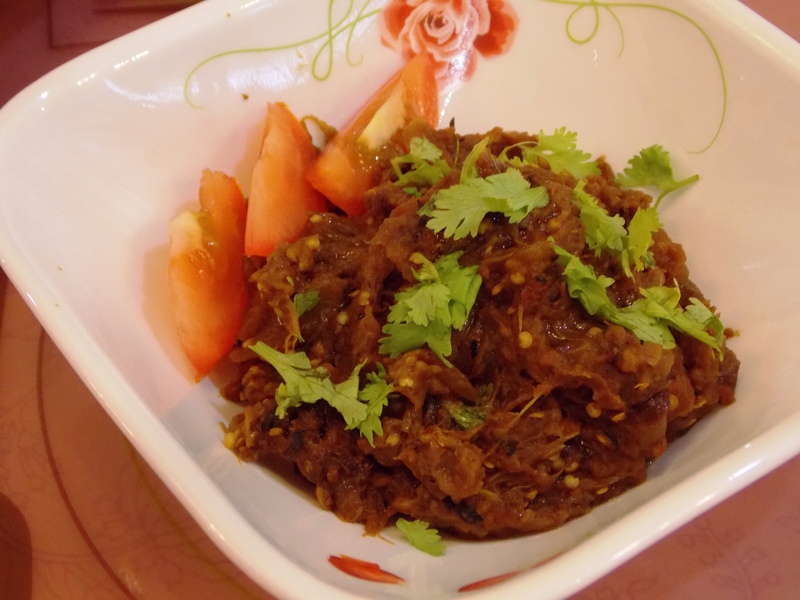 Garnish with chopped coriander leaves and serve hot with Roti (Indian Bread). Tomato wedges goes well on the side. My mom can vouch that i will relish even a boiled aubergine 😉 Bhaingan bharta is looking delicious ! !